karayal is a pulse based recipe, which is made from urad dal or moong dal paste, dal pakodi cooked in dal gravy with spices. karayal mostly famous in Up, Bihar and Northern India. I often cook vadi and moong dal ki mangodi at home. Whenever I prepare the dal to make vadi or mangodi, i often cook karayal for dinner or lunch. karayal with rice tastes delicious speacily during late winters. It can also be consumed with chapati and lemon onion salad, which enhances its taste even more. 7. Turmeric powder 2 tsp. Soak the dal for 6 hour at least. Wash the skin and blend in mixer grinder. Now whip the pulse well till the batter turns fluffy. Add 1 tsp salt to the dal mixture and 1 tsp red chili powder, keep 1 tbsp paste aside. Heat the oil in pan and make the small ball with this mixture. Now heat 1 tbsp oil in another pan and saute the ginger, garlic paste, then roast the onion paste till golden. Add red chilli powder, turmeric powder, coriander powder and salt.stir 2 minute and add chopped tomato. Cook the masala until the oil separates, mix the remaining dal in 5 glass of water and add in masala, Stir constantly and cook. It will take approximately 15 minutes, now add the ball cook for 2 minute more and turn off the gas. 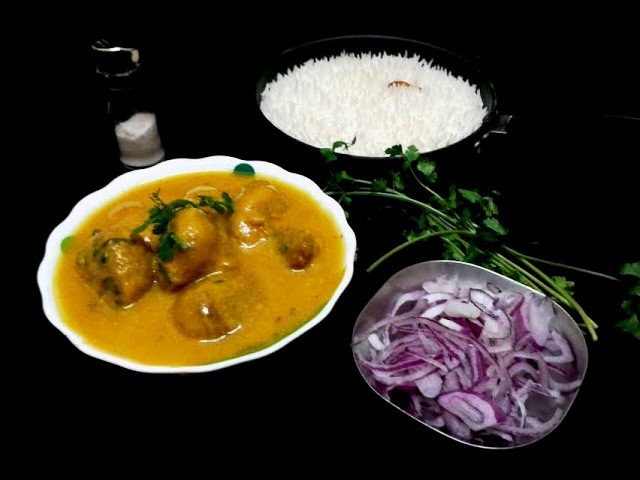 Add garam masla garnish with coriander and serve hot with boiled rice and onion salad. Note----Whip the pulse well to make the pakodi otherwise it will become hard.